Since mobile credits card readers were invented and an entire new industry was created for a new type of point of sale system was created utilizing iPads and tablets, the various competitions has done nothing but improved their features by challenging each other with various functionality. While one company would offer a lower fee for each credit card swipe, another would offer features that made their system more practical such as website integration or the ability to accept different forms of payment. Now, Square has announced that merchants using Square Register will have the ability to accept credit cards transactions even if their POS system can’t connect to the internet for authorization as well as improved inventory tracking features to keep merchants informed of what they have left.This news really isn’t all that shocking considering there were a few of Square’s top competitors that were offering offline credit card processing already, but it definitely takes away the incentive to use a different provider for merchants that were on the fence about choosing Square Register as their cash register solution. This is just another example from a long line of improvements that Square has been implementing as the race heats up for mobile payment supremacy. How it works is you swipe a credit card just like normal, but it allows you to complete the transaction even if the card can’t be authorized via the internet. When an internet connection is established, the transaction is processed and the customer’s credit card is charged as normal. This new features adds flexibility for vendors that work in areas where cell coverage is spotty and wireless internet is not an option. Additionally, Square is boasting improved inventory tracking; which has been the most requested improvement to date. As items sell, Square updates your inventory database so both the store and customers can know if something is in stock before a sale is made. This is also very handy for another new feature that Square integrated; a new “pickup” option. Particularly handy for merchants in the food industry, the new Pickup feature for Square Register allows customers to order an item online and pick it up in the store at a later time. This makes Square Register a more viable option for pizza shops and other industries where advanced ordering is crucial to their success. There is an additional fee attached for the convenience of this service however, and it clocks in at a whopping 8% for each Pickup transaction. Only time will tell if this new feature will be utilized enough to become a permanent fixture at that price, but it certainly opens up the realm of possibilities for new users of the Square platform. Recently, Square opened up an east coast office in New York City to help with their expansion moving forward. Square was finding that it had begun running out of steam as far as getting new businesses signed up, so hiring sales teams to tackle getting the larger companies on board was the next logical step. In a very unprecedented move, Square has opened up yet another office in the bay area (where the company is headquartered) to house an additional 50 sales staff. Located in Santa Clara, the aim of this office is to relieve the burden of commuting into San Francisco and also to make it easier for sales staff to visit businesses in the greater bay area.This move also comes only shortly after they upgraded their headquarters to a much larger building less than one year ago because of the massive growth the company is facing. The company nearly doubled the amount of sellers using Square as their payment gateway since 2012, so their cut of the revenues has the company trying to play “catch up” with their size and workforce. With well over 100,000 retailers using Square in the bay area alone, it’s easy to see why continuing to expand so close to their roots is a very good idea. On top of all that, the company’s CEO Jack Dorsey has made no secret of his feeling on doing business directly with working cities. The opportunity for growth in these cities is unparalleled with anywhere else on Earth, so planting roots and sending out the sales teams can yield great results in these types of population centers. Jack Dorsey even claims that he has intentions of becoming Mayor of New York City one day, a bold ambition that shows just how much he loves being entangled in city life. Though the idea of Square opening another office isn’t anything new with offices also in Tokyo, Kitchener-Waterloo, and Atlanta, this is the first time they have built 2 in such close proximity to one another. Though some critics complain that they should be targeting other major cities like Chicago or Dallas, the proof is in the pudding and Square is continuing to make money despite their clinging to home turf and seemingly slowing the pace at which they grow. You would be hard-pressed to find a business owner who isn’t familiar with the famous credit card reader that was created by Square a few years back, and concept behind Square Register is all but a household name at this point. Now, Square is using its big name and trendy product to help (RED) in the fight against AIDS with a new edition of its card reader.Dubbed “SQUA(RED)”, anyone interested in contributing to the cause can get their hands on one for a $10 donation. Available in the limited edition color red, 97.25% of the $10 donation to get a SQUA(RED) credit card reader will go towards the fund to fight AIDS. Additionally, the receipts that are emailed to your customers when you use SQUA(RED) will automatically include a link for an extra donation if they wish to help as well. The premise of this campaign is that Square prides itself on helping millions of small businesses and individuals grow their business, and now they want to use their success and reach to help people struggling in the fight against AIDS. By empowering their retail users to reach out to their local community and help in this fight, they can transcend from a corporate powerhouse to a good steward of the world at large. This isn’t the first time that Square has released a specially branded version of their credit card reader. In 2011, Square teamed up with Vivienne Tam to design a card reader to benefit the Happy Hearts Fund; an organization which aims to improve children’s lives through educational and sustainable programs in natural disaster areas. Similarly to the SQUA(RED) reader, all the proceeds from the $10 donation went directly to the fund. It seems as though corporate philanthropy is a recurring trend with Square, and one would likely expect to see more of the same in the future. It is hard to know exactly how effective this latest campaign to fight AIDS will be since it hinges so much on the participation of retailers using the special edition card reader to send out receipts with donation links and the reception customers give the links with donation money. One thing is for sure, the fact that Square is trying is worth applause regardless of the results. The rate for everyday Square customers is set at 2.75% per credit card transaction, but that isn’t true for everyone who uses their mobile payment platform anymore. Obviously, major companies such as Starbucks and Whole foods are getting a better rate because of the amount of transactions they will be processing, but now smaller vendors are able to negotiate for lower rates. Recently, Square added a feature to their website that allows vendors to request a custom rate. This isn’t going to help out someone running a garage sale or going around $100,000 in sales each year, but it is certainly helping out people who do upwards of $1 million in sales per year. Reports have been surfacing that Square has been backing “backroom” deals with vendors all over the country to give them lower fees in exchange for continued loyalty. This all came about because there are hundreds (or possibly thousands) of small businesses that have expanded since their early days when Square Register was the only affordable platform that made sense. As many of these small businesses expanded into multimillion dollar enterprises, the notion of moving to different POS systems was more logical because the cost of a merchant account would be offset by the amount of transactions they are no conducting each year. Now Square will work with these retailers to keep them swiping with Square and keeping them paying fees for the foreseeable future. Square has had a beautiful ride with their word-of-mouth advertising campaign that has made them a household name. However, now that everyone knows about Square Register and what it does, they have reached everyone they possibly can with traditional methods. The true money for the company lies in well-established businesses converting to using Square Register instead of the traditional style POS systems that they have been using for years. This type of sales requires more than word-of-mouth, it requires a well-spoken tongue. To increase the amount of established businesses that are weary of the idea of making a switch to Square, they have ramped up hiring for their sales force to the ground running. The job of these new recruits will be to find potential businesses and negotiate a transfer to Square; even if they need to rely on custom pricing to pull it off. Square is hungry for new revenue from businesses that are forking over too much to someone else. Many companies out there are still using traditional merchant accounts even though they don’t do enough transactions to offset the cost of paying per swipe like they would with Square. Many business owners are afraid to commit to a pay-per-swipe pricing structure even though it could save their business thousands of dollars in fees each year. Only time will tell if the new marketing efforts will help Square continue to grow, but based on their recent successes I would wager that their odds are pretty good. Since Square was able to broker a deal with Starbucks to get their payment platform in use at their coffee shops, all has been fairly quiet for the mobile payment giant in terms of acquiring new big ticket contracts. However, that all changed recently when Square and Whole Foods got together to talk about integrating Square Register as their cash register engine for everywhere in the store except the checkout lines.In 2013, Square released a new piece of hardware called Stand that was crafted specifically for larger retailers like Whole Foods who wanted a professional looking and durable POS stand without the price and expensive setup fees. As the two companies appear to have made a deal, it also looks that investment into the Square Stand technology is beginning to pay off. Though the deal will not put Square Register at every checkout line, it will put them at every other kiosk throughout their stores including the sandwich counters, juice and coffee bars, pizzerias, and beer and wine bars. This move is aimed at making the checkout experience much faster and easier for customers who in some cases had to stand in line with their sandwiches at the checkouts in front of the store with the grocery shoppers or wait for clunky push-button style registers at kiosks in a given department. All of these transactions will now be handled using Square Register on their Stand hardware instead. While this move will make it faster for the customers going through the Square-powered checkouts, it should also cut down on the lines at the main checkouts that were cluttered with some of these customers as well. In theory, the move will not only make it a better experience for some of the customers, but all of them. Whole Foods did an estimated $13 billion in sale during 2013, so Square is anxious to get the program up and running and Whole Foods is excited to be a leader in the mobile payment revolution that is growing every day. While Whole Foods has plenty to gain from this deal, Square comes out as the clear winner overall. Not only will they make transaction fees on a good chunk of the purchases at Whole Foods, but they also get another big name business on the chalkboard that is using their payment systems. It is also another step forward for Square Wallet since customers at the grocery vendor will be able to use it to pay for their items even faster. Lastly, Whole Foods even agreed to be a “laboratory” for new Square products and test them ion a real-world environment. Though it serves their interests to help Square create a better product, it is clear the Square is getting perks across the board with this latest deal. If you were writing a story like the tortoise and the heir only using that reference for business instead, then Square would certainly be the tortoise and someone like PayPal would be the heir. Since they first came on the market, Square’s shares have steadily grown mother after month and year after year. In 2011, Square was processing a mere $10 billion in transactions for the calendar year, $15 billion total in 2012, and $20 billion in 2013. However, they are projected to clock an amazing $30 billion in 2014 through their apps and free credit card readers.As they have become more popular and more retailers have started using their platform, the profits for the company have increased at the same rate. With their most recent round of funding, Square was valued at an amazing $5 billion. Not too shabby for a company that had a value under $50 million in 2009. Here’s a breakdown of Square’s rounds of funding and what the company’s value was at that point. As you can see above, Square has increased its value significantly in just 15 short months. Since they processed $20 billion in 2013 and project to process $30 billion in 2014, one may ask how those numbers line up. The simple fact of the matter is that investors are apparently betting on the next 12 months of income much more than the 3 year growth plan that most investments are predicated on. Furthermore, since Square is growing into other segments of the market to take on Google Wallet and PayPal with their own twist called Square Wallet, Square is tapping into new ground constantly and turning up all sorts of new revenue streams. With payment processing getting easier and easier for both customers and merchants alike, the future is looking very bright for Square and their next valuation is likely to be even higher than this last round. After the recent announcement of their new credit card reader, Square has also debuted their newly designed website and dashboard. This has been a much-awaited release after Square updated their popular Square Register application several weeks back with new features and a simpler user experience.Square’s goal, as stated by company spokespeople, is to bring the website towards the same direction that all users want web design to go. This means the same ease of use across all devices in all countries in the world. With this in mind, Square put a lot of effort into the new design so it would function identically on a PC, tablet, or phone without having to change a user’s habits whatsoever. Additionally, their new site is embracing vector animations which are scalable without quality loss and able to stream at the maximum refresh rate of 60fps for smooth scrolling. It is also very clear with the new design that Square is putting more steam behind the Square Marketplace platform in a big way. Additionally, they are putting a very strong emphasis on their hardware and retail technology including the Square Stand and their newly redesigned Square Register app for iPads. Overall, the new Square website does a much better job conveying the products and services that the company is focusing on currently rather than just being a gateway to the mobile payment dashboard like it has over the last few years. Though there are sure to be some more tweaks on the horizon to their new website (especially in the dashboard area), it is clear to see the direction that Square is aiming for with its current and future products just by looking at the new design. Though the market is very fluid right now and they may find it necessary to change the site again sooner than later, they are pushing the envelope forward for website designers across the board with their new and attractive design. Square recently announced their acquisition of the company Evenly, which was a top competitor with Venmo for sending and receiving payments among friends. This deal comes on the heels of Braintree acquiring Venmo last year, who is also in the market for a buyer. The point behind the app from Evenly is to split and share bills among friends from their smartphones.The way it works is that each person has a list of contacts in their app that they can share with. Users can request and pay funds into a pool that is organized around specific events or expenses. For instance, if you were planning a bachelor party and the total bill was going to be $500, each of the 10 participants could chip in $50 to pay the bill equally. The concept also works for other expenses such as dinner or concert tickets; pretty much any occasion where splitting a bill with people is necessary. Though the purchase is already done, Evenly will stay in business until mid-January of 2014. According to Evenly, they will keep their servers up and running for an ample length of time so that all of their users can pull the money from their accounts. There services will only be available to users who are already setup, however, because the app has already been pulled for Google Play and the Apple Store. With the shutdown of Evenly, this move is clearly more about obtaining the talent of the 5 person team versus the brand itself. With Square Cash trying to get a foothold against Venmo and Google Wallet, bringing on this type of talent to bring new life into the app is a crucial step to taking over this segment of the mobile payment industry. With Google eating up all the talent as fast as they can, Square knows that they need to act quickly when highly skilled people are available to beat them to the punch. In a much-anticipated announcement for Square, the industry-leader in mobile payments unveiled its new credit card reader. Boasting its much smaller design, this new reader is also more secure than its predecessor and is much more accurate. This means that you should be able to get a good read from those tattered magnetic strips on the first swipe rather than having to try over and over before divining up and manually typing in the numbers.Furthermore, Square claims the new card reader is compatible with devices that previously would not recognize them through their headphone jack. This is great news for people who use Android phones or tablets because there were several model that wouldn’t accept the reader before; namely tablets with larger than 7 inch screens and the ever-popular Nexus 7 line of tablets. Though the new design doesn’t fix all of the compatibility issues, it is certainly a step in the right direction. While users of Square Register can get their hands on the new credit card reader via their website, the new version will not be available on store shelves until early 2014. This delay should be long enough to allow the current stock of the old readers to filter through the marketplace. While most users just order them for free from Square itself, having them available at a moment’s notice at your local shops can be a big lifesaver if your business relies on one to swipe cards through your POS system. The size of the new credit card reader is actually quite an impressive improvement. Much to my surprise, they were actually able to make the dongle about ½ of the size that it was previously. To put this into perspective, this is about as thin as the new iPhone 5S and just slightly thicker than the iPad Air. This was a crucial development since most people use the credit cards readers in conjunction with an iPad for their mobile POS systems, so rivaling the same thickness was vital for most of the stands coming out that are approved for use with an iPad Air POS system. Accepting tips is crucial to many business types such as coffee shops, bakeries, and cafes; which make up a significant chunk of the merchants that utilize Square Register. This is mainly because of the low upfront costs and extreme portability that a phone or tablet based POS system offers these types of small businesses coupled with their ease of use. This notion is carried through beautifully into the process of accepting tips when using Square Register and the process is very simple.The process will vary slightly depending on what device you’re using, but we have outlined the differences in each step. Just follow each step and pay special attention to the notes that pertain to your specific device to make the learning curve as simple as possible. If you are using an iPhone, tap the gear icon. If you are using an Android device, tap the three horizontal lines at the top left of the screen. If you are using an iPad, tap the three vertical lines on the bottom navigation bar. Next, tap on "Settings" followed by tapping on "Tipping." Toggle the "Collect Tips" switch to the “On” position. *Note: If you have the "Signature" settings enabled, the tipping option will automatically be shown on the screen where the customer signs. If you have the “Signature” preference turned off for payments that are under $25, then your customers can select a tip amount after the payment is processed to be added to the original total. If a transaction is less than $10, the available tipping options are: No Tip, $1, $2 or $3. For a transaction $10 or more, the available tipping options are: No Tip, 15%, 20% or 25%. Tap each amount field to enter your preferred percentage. 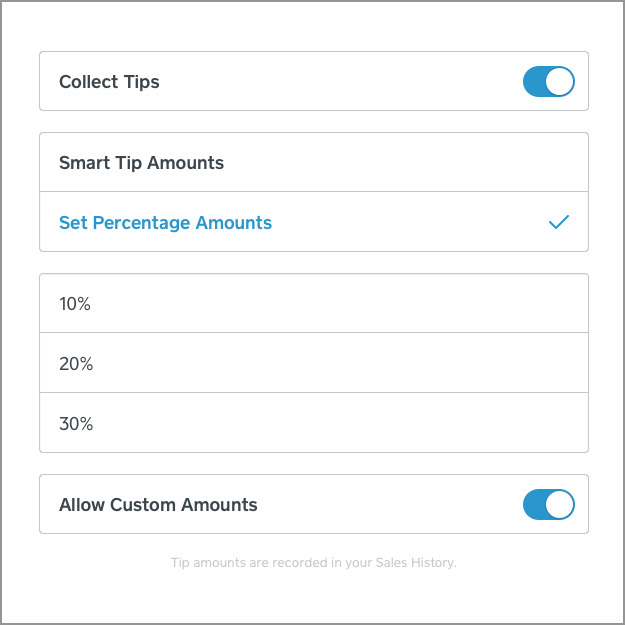 To allow your customers to enter a personalized tip amount of their choice, toggle "Allow Custom Amounts" on. *Note: 100% is the maximum tipping amount. Tip amounts are recorded in your Square Register sales history for reference. United States Patent No. 7,711,100, entitled "System and Method for Controlling Financial Transactions Over a Wireless Network," asserted against Square Wallet. This patent generally relates to location-based, financial transactions made by wireless devices. United States Patent No. 7,376,433, entitled "Subscriber Delivered Location-Based Services," asserted against Square Wallet. This patent generally relates to location-based merchant selection and transactions made by wireless devices. United States Patent No. 8,275,359, entitled "Wireless User Based Notification System," asserted against Square Wallet and Square Register. This patent generally relates to location-based mobile device notifications. Though it is unclear at this moment if the charges are true in part or in whole, but Square’s reluctance to offer a deal in the way of a licensing deal gives a clear picture that Square disagrees with their assertions. Only time will tell how the litigation fairs out for either company, but as most of the other lawsuits brought against Square it is likely that this one too will disappear quietly into the night; whether settled or just out-muscled. If you are one of the tens of thousands of people who use Square every day, then you know how convenient and handy it is to have the ability to take the occasional credit card payment right from your phone. When the payment company released their app Square Register, it revolutionized point of sale systems by giving merchants all the features of the bulky hardware versions while not locking them into expensive merchant accounts and fees. Since the release of the original app, the interface has gone pretty much unchanged; other than a handful of updates to increase security features.Now, Square has release a totally redesigned version of their register app despite the fact that the previous release didn’t have any issues. Building on what they learned the first time around, Square Register has been revamped with a new user interface, to make navigation easier and more enjoyable for the merchant in control. Furthermore, Square added a few new features to make the app even more versatile and desirable as they chip away at gaining the loyalty of the last hold-out merchants. Most notable, the new design makes everything fit nicer on your screen while giving you faster access to the features you use most. These changes affect the Android and iOS versions of the app, but also show up on the web dashboard to avoid any confusion across the board. Some of the new features include the ability to apply discounts to items already in your database, as well as a simple and robust tipping system integrated right on the signature screen so your customers can choose no tip, 10%, 15%, %20, or enter in a custom amount for their gratuity. The latter feature is yet another step that the Square Register app has taken to appeal to restaurant owners. Also, this new release is boasting improved compatibility with Android devices across the board; though you will still need their patented credit card reader. Other than the original Nexus 7 (which has also had issues with the previous Square release), this new version is approved for use with any device running Android 2.3 or higher. While that doesn’t quite include everyone or every Android device, it is certainly an improvement and shows how interested Square is in making the award-winning service available to every single merchant. As many small businesses that use Square Register to process their payment know, Square had previously made available a monthly fee for swipes up to a certain dollar amount rather than having to pay 2.75% each swipe. This pricing structure made taking payments much less expensive for some merchants, but Square recently announced that they are discontinuing their monthly pricing option. Though the news is being met with mixed reviews, Square has released some details about this move.Why is Monthly Pricing Being Discontinued? Square is standing behind this decision because they feel that the overall cost for businesses to use their service can be reduced by increasing the overall volume of transactions. While the monthly rate was originally designed to entice large businesses to use the product, Square reports that they received an overwhelming amount of complaints from businesses claiming the unrealistic transaction caps led to a restriction in growth and higher swipe costs overall. Square claims that after this unsuccessful “experiment”, they can offer a better deal to all merchants by charging one low flat rate across the board. When asked if there was a plan to reinstate a monthly rate in the future, Square said it wasn’t currently in the cards but refused to rule anything out. As of January 31st, 2014, all Square accounts that were enrolled in monthly pricing accounts will be rolled over into a standard pay-per-swipe account. After January 2nd, 2014, users who were enrolled in monthly billing no longer receive bills for monthly fees and will be covered for enrollment through the January 31st deadline. Users who wish to make the switch to a pay-per-swipe account before that date need to unsubscribe before their billing date at the beginning of December. Are Rates Going to Change Again? Though Square cannot guarantee any type of permanent rates because of variables like market conditions and overall demand, they remain committed to keeping user charges to a minimum. They are also working hard to stay on top of the features that are needed by both large and small businesses to stay competitive. Square also stated that users can expect stable pricing for their pay-per-swipe plans for the foreseeable future, but that could change at any time. Anyone who has been using the popular mobile payment app Square Register is likely familiar with the higher fees associated with manually typing in a credit card number rather than swiping it through their free credit card reader. Instead of a mere 2.75% fee, you used to be charged an additional surcharge for the risk they take of not having the customer’s signature. This was among the few restrictions that Square users were dealing with since the company’s inception, but luckily they’re headed for a fairly drastic change.Very recently, Square made the announcement that they were no longer going to enforce deposit limits or holds on credit card transactions that were complete by typing it in manually rather than swiping. The biggest benefit here is that the funds accepted by a user through the app will be deposited within two days regardless of how the card information was entered, which is great news if you have ever had a credit card that didn’t want to go through the credit card swiper. However, while many merchant who use the award-winning payment platform rejoice at the new lax point of view, some skeptics assert that there will be an increased risk of fraud and that the company may be exposing themselves to unnecessary risk with this new policy. Those skeptics cite the fact that Square put the original policy in place for a reason, thus there must have been evidence that fraud was a possibility if those safeguards were not instilled. Nevertheless, Square is sticking to its guns and claiming the move as a victory for small businesses that rely on their service and can now maintain a much simpler cash flow. This is vital not only to merchants but also to Square as competition in the mobile payment market starts to heat up with new ideas and intuitive designs throughout every niche of commerce. Though Square processes over $15 billion in payments each year already, there is certainly room for growth and the added risk can easily be paid for with the increased demand that they are likely to receive because of these policy changes. When Square released its new physical cash register component called Square Stand, the largest question on consumer’s minds was where they were going to purchase it. Though you can acquire one through the Square website, having to wait for an item to be shipped can be a bit of a turn off. Also, if you are a merchant who already uses the Square Stand, then having the ability to go to a brick and mortar store for a replacement stand is a crucial part of the market appeal. Fortunately, Square announced recently that they have finalized a deal with the office supply giant Staples to do just that.First released in May of 2013, the Square Stand is a $299 attachment piece to a standard sized iPad that turns it into a full-fledged POS system in conjunction with the Square Register app. The relationship with Staples is also very important because the Square Stand expands the uses of Square from simply taking credit cards on a smartphone to a commercially useable platform. Expanding the usability of Square is vital to stay competitive, especially with well-established companies like PayPal targeting their success. While the overall success of the Square Stand is somewhat unclear, having them available for purchase in Staples stores will undoubtedly give them a quintessential boost. This can be attributed to the ease of walking into a store to buy one, having them available to demo, and the fact that buying a product that you’ve never used online can be intimidating. Also, reluctant business owners who have been using other types of POS systems will be hesitant to make the change, something that having them available in Staples should also help with. This major deal with Staples comes on the heels of making deals with several retail locations to offer the traditional Square credit card reader that plugs into the headphone jack of smartphones and tablets. Square has made deals with Apple, Best Buy, Staples, and Starbucks to carry the readers for a combined 30,000 locations in the United States. Its unclear how many other locations will potentially carry the Square Stand for sales, but Square certainly gives the indication that it is looking for more potential retailers. Open the App Store, and then tap on the button labeled "Updates" in the lower right corner of the screen. Tap the button labeled "Update All" to install the updates for all apps including Square and Square Register. *You'll need to enter the iTunes password for your Apple device in order to upgrade your apps including Square. If you forget your password, you can always reset it. Reset your iTunes password. Open Google Play, and then tap the menu button followed by "My Apps." Locate the Square app you wish to update in your list of apps and tap on it. Tap "Update" to begin the download and install the update. *If you have problems installing or updating Square apps on your Android device, your version may not be supported or considered out of date. You can check if your device meets the required specifications on the device manufacturer’s website or your retailer. Microphone: Use of the microphone is required for the Square credit card reader hardware to communicate payment data to your mobile device. Camera: The Square Register app uses your camera to add your company logo and pictures of your items. While not implicitly required, access to your device’s camera is required for full functionality. Geo-location: For security reasons, Square must know the location of all transactions to eliminate fraud and reduce payment disputes that drive up costs. For this purpose, your device’s geo-location, also called GPS, must be turned on at all times when using Square apps on your mobile device. In an unexpected move by the accounting software giant Intuit and the leader of the mobile payment processing Square, the two companies have forged an alliance to bring more control and functionality to their popular platforms. While Intuit has their own credit card readers that work with smartphones and tablets called GoPayment, the vast majority of people using mobile payment technology for POS systems prefer these ease of Square Register over any other software. The firm hold that Square has on the mobile credit card processing market has led to the willingness for Intuit to open up their software for integration with one of its major competitors.The full details of the deal have yet to be disclosed, including what features will be integrated and what the profit sharing numbers for each company will be. Also, while Square does not officially offer a universal API for third party software integrations, Intuit has specifically said that such an API exists and is the basis for the integration with QuickBooks. Beyond these vague details, very little is going to be released about the details of this new partnership or the functionalities it will feature. There is speculation that the QuickBooks will be lackluster in its integration with Square because of GoPayment; Intuit’s version of a mobile credit card reader. However, a spokesperson with the company has assured potential users that the two companies are moving in different directions as far as payment platforms and that each sale will flow directly into your QuickBooks software as if it was part of the system from the get-go. While this news excites many small business owners who use the very popular QuickBooks platform to keep their books in order, there are still plenty of lingering doubts. The lack of transparency that the companies have about how it will work and what features it will provide have left many questioning the partnerships viability. Rumors of features like inventory management being left on the wayside along with some of the core features available in the Square dashboard have many potential users on edge and running for time-tested solutions like Shopventory to handle tracking their inventory and sales data for Square Register as the technology continues to change and adapt. Recently, Square implemented a new feature to their service; Square Market. This new feature allows any merchant that processes payments using the Square system to sell their goods online for no additional fee. Now when adding new items into your item library within your Square account, you can choose to offer them for sale online by adding a description, photos, and configuring shipping information and fees.Sources within the company point to data that claims users of their popular Square Register application, which turns an iPad or Android tablet into a complete point of sale system, were looking for a way to combine their customer’s in-store shopping experience with a virtual online experience that was no longer confined to their brick-and-mortar locations. By adding Square Market as an option for their merchants, local businesses can now offer their goods to customers down the block and across the country. Along with some of the obvious perks, Square Market allows merchants to start building an online presence without the need for an expensive website or ecommerce software to integrate an online shopping cart and pay fees for a merchant account. Instead, the same 2.75% fee that is charged for any transaction through Square is applied and a merchant’s items can be made available online with just a few clicks of the mouse or touchscreen. Additionally, each merchant’s online store will be listed online on the Square website within their Square Market directory; a benefit that most online shops are not afforded which can increase exposure and visibility to other Square Market users. Though the platform is new and is being rolled out cautiously, Square Market is the latest attempt by Square to become the world’s largest and most flexible payment gateway regardless of where you are purchasing your goods. Once merely a mobile point of sale system, Square is now taking the online payment world head on. Along with other endeavors such as the recently announced addition of kitchen tickets into to very popular Square Register application, Square Market will also keep your inventory correct between store sales and online sales using popular applications like Shopventory to track and manage all of your data.